What: Traveling exhibition of the First Folio from the Folger Shakespeare Library, features the first collected edition of Shakespeare’s plays, now on national tour for the first time. About: Entry to the First Folio gallery is free and open to the public; access to all other galleries requires paid admission. Carlos Museum members and Emory students, staff and faculty have free access to all galleries. For museum hours and more information, visit here. The First Folio of William Shakespeare, published in 1623, is widely considered one of the most famous books in the world — and for good reason. Four hundred years after his death, Emory joins an international remembrance of the legendary playwright with a campus-wide celebration that includes a rare public exhibition of the First Folio — the only display of the literary treasure in Georgia. “The First Folio: The Book That Gave Us Shakespeare” opens Saturday, Nov. 5, and runs through Sunday, Dec. 11, at the Michael C. Carlos Museum. The Emory display is part of a national traveling exhibition sponsored by the Folger Shakespeare Library, the American Library Association and the Cincinnati Museum Center that will bring the playwright’s first published collection to all 50 states, along with Washington, D.C., and Puerto Rico. When Shakespeare died in 1616, only about half of his plays, which were written to be performed, had been published during his lifetime, notes Emory English professor Sheila Cavanagh, director of the World Shakespeare Project. "The First Folio includes the first printing of many of Shakespeare's plays," she says. "If his colleagues had not gathered Shakespeare's works and published them in this volume, we would not have many of the plays we associate most closely with Shakespeare." Fellow actors would eventually compile 36 of his plays, hoping to preserve them for future generations; 18 appear for the first time in print in the First Folio, including "Macbeth," "Julius Caesar," "Twelfth Night," "The Tempest," "Antony and Cleopatra," "The Comedy of Errors" and "As You Like It." Folios are large books, created by folding printed sheets in half to create two double-sided leaves, and were typically reserved for some of the most significant texts of the day, including history, science and the Bible. Shakespeare’s First Folio was the first folio produced containing only plays. And its publication had far-reaching effects, inspiring, among other literary trends, the creation of today’s fine press and artist’s books, notes Cavanagh. While on display at Emory, the pages of the First Folio will be opened to the most quoted line from Shakespeare and one of the most quoted lines in literature: “To be or not to be” from "Hamlet." The First Folio also includes a title-page portrait of Shakespeare by English engraver Martin Droeshout — one of only two likenesses of Shakespeare that are considered authentic, because it was approved by those who knew him. Accompanying the rare book will be a multi-panel exhibition exploring the significance of Shakespeare, then and now, with additional digital content and interactive activities. Leading up to the arrival of the First Folio, the Second (1632), Third (1663) and Fourth Folios (1685) have been on display in Emory's Rose Library, and they will be incorporated into the First Folio exhibit. The opportunity to view these folios within a broad context is made possible by a loan of the Second and Third Folios from Rose Library benefactor Stuart A. Rose. Shakespeare at Emory events began last spring and will continue through this academic year, with a variety of activities, presentations and exhibits hosted by the Carlos Museum, Emory Libraries and Theater Emory. 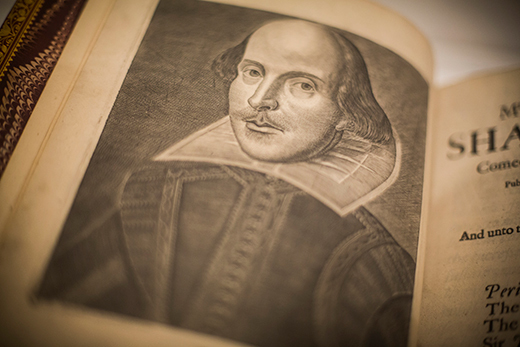 Once the First Folio arrives on campus, Emory will host several key events celebrating and exploring its place among the world's most famous books. “Will of the People: Shakespeare’s Folios and Their Meaning in Our World," Shakespeare at Emory's official opening event, is set for Nov. 10 at 7:30 p.m. in Emerson Concert Hall in the Schwartz Center for Performing Arts. Jazz musician Dwight Andrews presents Duke Ellington's "Such Sweet Thunder" as internationally recognized scholars Nicholas Grene, Tom Magill and Ayanna Thompson explore Shakespeare's place in the African American arts tradition and in modern Ireland. On Dec. 5, the official closing celebration, "The Bard and Poetry," features former U.S. Poet Laureate Natasha Trethewey, Robert W. Woodruff Professor of English and Creative Writing, and award-winning poets and Emory professors Kevin Young and Jericho Brown. Emory will also host a wide range of lectures, workshops and family-friendly activities while the First Folio is on campus. Theater Emory presents "Romeo and Juliet" from Nov. 3-13. The Emory Cinematheque series "Shakespeare on Film: Outstanding Adaptations" concludes Nov. 4 with "Titus." A series of staged readings will examine interpretations of the Bard's work, including "Castelvines y Monteses," Spanish Golden Age playwright Lope De Vega's 1603 version of the Romeo and Juliet story, on Nov. 7; "Fortunes of the Moor," a new vision of Shakespeare's "Othello," on Nov. 9; and "The Book of Will," Emory alumna Lauren Gunderson's play about the co-editors of the First Folio, on Nov. 13. The Carlos Museum continues "The Bard in Bollywood," screening Indian filmmaker Vishal Bhardwaj's Shakespeare trilogy with introductions by Deepika Bahri of Emory’s English Department. Remaining shows include "Omkara" on Nov. 8 and "Haider" on Nov. 15. On Nov. 11, Margaret Edson, Pulitzer Prize-winning author of "Wit" presents “The Soul of ‘Wit’: An Evening For Educators” — an exploration of the free-wheeling, slapdash world of Elizabethan theater. The Carlos Museum hosts family-friendly events including "All the World's a Stage," a storytelling event on Nov. 12, and a bookmaking event on Nov. 20 where children will experiment with bookmaking techniques. On Nov. 14, Magee hosts "Shakespeare's Words and Works," a Creativity Conversation with two Emory alumni, playwright Gunderson and antiquarian bookseller Daniel Wechsler, on their journeys into the world of Shakespeare. The Shakespeare and Accessibility Symposium, set for Nov. 16, features a number of American and international actors, directors, singers and professors who will discuss ways that casts, audiences and designers have become more diverse in the world of Shakespeare. On Dec. 5, prior to the closing celebration, Michael Witmore, director of the Folger Shakespeare Library, discusses "The Wonder of Will," the legacy of Shakespeare and the Folger Library’s extensive collection of the Bard in print. “First Folio! The Book That Gave Us Shakespeare” is made possible in part by a major grant from the National Endowment for the Humanities and by the support of Google.org, The Lord Browne of Madingley, Vinton and Sigrid Cerf, British Council, Stuart and Mimi Rose, Albert and Shirley Small, and other generous donors. For more details about these and other events, including which events require registration, visit Shakespeare at Emory.